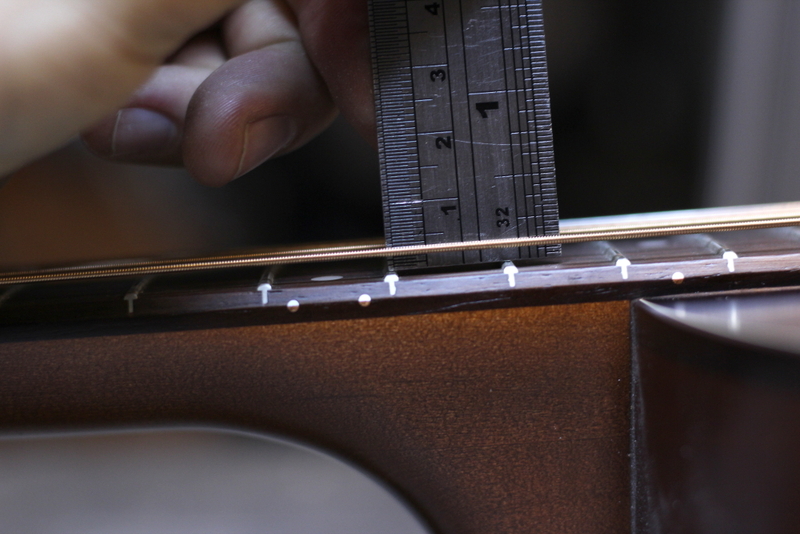 One of the most popular routine services our repair department offer for guitars – is to have them ‘set up’, which constitutes a series of adjustments to get them to their optimum playability and sound. As guitars are made from multiple parts, many of which can move with atmospheric conditions or through the rigours of regular play, it’s an important part of guitar ownership – a bit like getting an MOT and service on your car. If you have bought a guitar from us you will even have the offer of a free set up in the first year. So how do you know when it’s time for a set up? What happens during a set up? 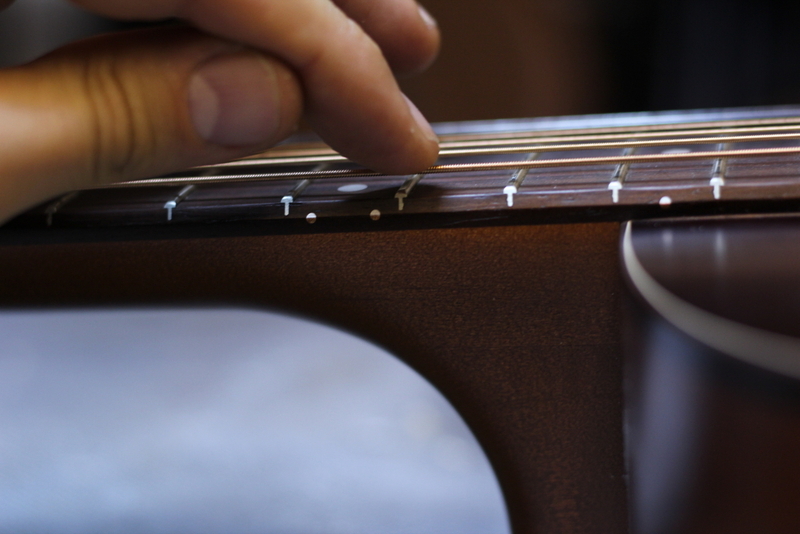 A set up on any guitar will include adjusting the strings so that they are correct height over the fingerboard. This involves setting the nut to the correct height, adjusting the straightness of the neck and setting the height of the bridge. Sometimes there will be troubleshooting involved as a high or low fret prevents the neck from being adjusted to where it should be. For an electric guitar, the bridges are usually adjustable to allow the intonation to be set (this is almost always preset on an acoustic). If the guitar has a vibrato system this will be calibrated so that it works smoothly and the guitar stays in tune when the vibrato is used. When we carry out a full set we also polish the frets, give the guitar a clean and, for electrics, balance the pickups and check the electric components work smoothly and without crackles. How do I know if I need these things doing? If you’re not sure, the easiest thing is to bring it in and we’ll take a look! However, we think it’s useful to be able to have an idea what’s involved in setting up a guitar and to be able to spot when things aren’t as they should be. 1. My guitar is too hard to play / my guitar buzzes! We'll address these two together as they're really two sides of the same coin. Your most likely candidate is the neck. If it feels like it’s a struggle to hold down the strings, or it’s easy to play but you can hear annoying buzzes and rattles as you play on some parts of the neck then we need to take a look at the nut, the neck relief and the action. Firstly, your nut (the bit where the strings break over the edge of the fingerboard towards the tuners) might not be cut correctly. f the nut slots are too high there will be two potential problems: the guitar will be hard to play in the open positions as you will have to pull the strings downwards more than you should do, and some or all of the notes on the first couple of frets will sound slightly sharp due to you bending the string slightly as you pull it down onto the fret. If the nut slots are too low then the open strings will sound choked and not ring out fully compared to any fretted note when you play them. Ideally there should be a tiny gap between the first fret and the string – enough to pass a sheet of thin paper underneath. If the gap is much bigger then it’s probably going to cause problems. Adjusting a nut is a skilled job and if you make a mistake you’ll have to replace the whole nut, so it’s best left to a technician if you don’t know what you’re doing! The nut is generally something that needs to be done once and can then be ignored, but there are two other factors that effect the playability of the neck that can be affected by changes in atmospheric conditions (particularly temperature and humidity) so are likely to need adjusting on a more regular basis. If your nut is set correctly and the guitar is still hard to play, the next thing to look at is how straight the neck is. 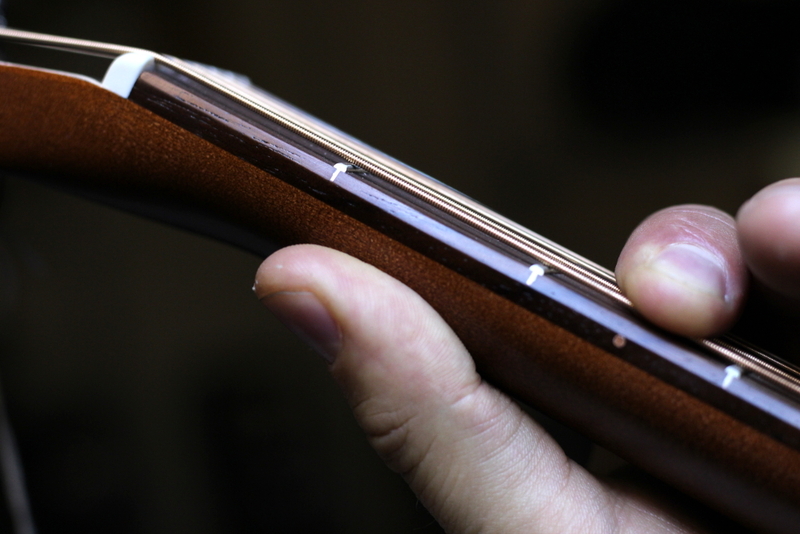 Typically a modern steel string guitar neck bows forward under string tension: we refer to this bow as neck relief. A little bit of neck relief is desirable as it compensates for the envelope in which the string vibrates, but too much will mean the strings are lifted away from the fingerboard and will be harder to press down than they need be. Since your guitar neck is made of wood that can expand or contract due to environmental factors – in fact, most necks are made from two different species of wood that behave differently to each other with changes in those factors – the exact amount of bow in the neck will be different depending on the environment the guitar is in. Because of this modern steel string guitar necks are equipped with an adjustable rod called the truss rod that allows the amount of relief in the neck to be set by a technician. 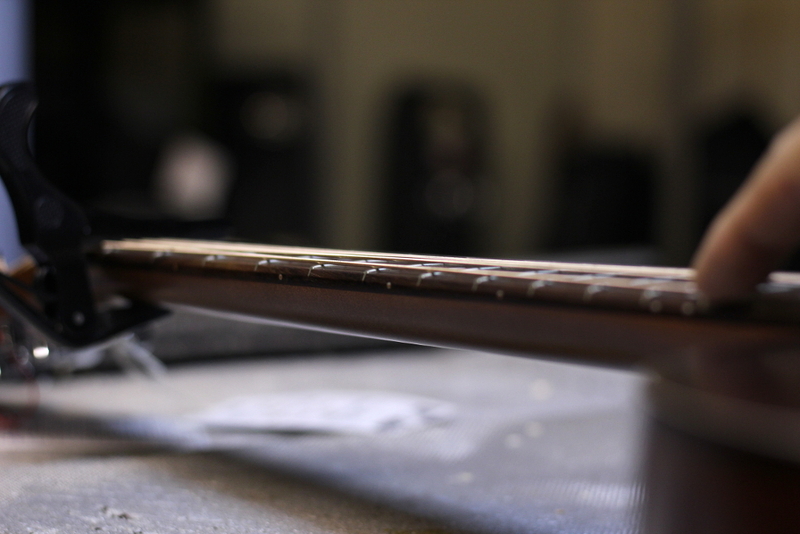 Adjusting the truss rod is something some people will be comfortable doing themselves but improper use can do a lot of damage, so if at all in doubt it’s one to leave for the tech to adjust, but you can easily see if your truss rod needs adjusting. Simply put a capo on the first fret and hold the string down where the neck meets the body: this will turn the string into a straight line against which you can see the curve in the neck. Look at the relationship between the string and the fret board at around the 7th fret: if the string is touching the fret then the neck is straight or even back bowed, and if there is a gap then the neck is bowing forward. Neck relief is a little subjective but generally there should be a tiny gap in the region of ¼ to ½ a millimetre – if it’s much more than that the guitar is going to be hard to play and in need of adjustment. A neck with back bow will typically cause lots of buzzes and rattles as you play and similarly will need adjusting to eliminate the buzzes. 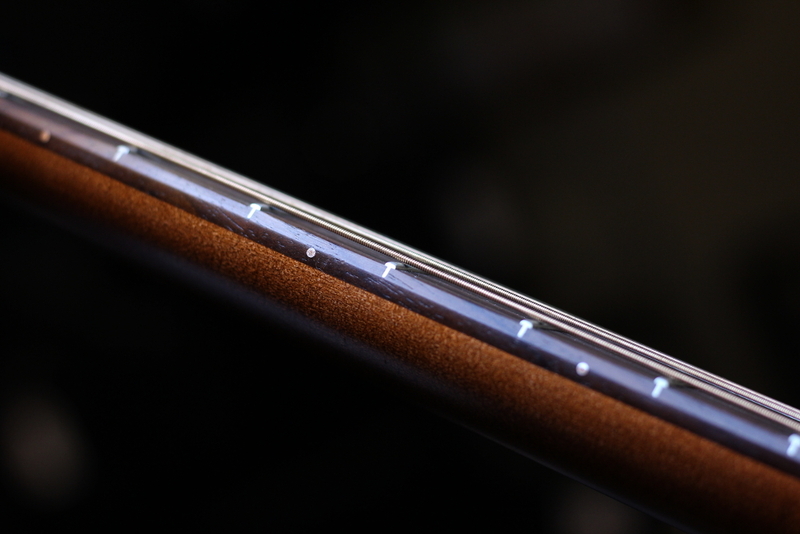 There isn’t a hard and fast rule as to what this height should be as different players will have their own preferences, but for a guitar in the shop we set acoustics at 1.5mm for the top E and 2.5mm for the low E. Electrics will usually be a little lower depending on preference. If the strings are significantly higher the guitar will be harder to play and if they are significantly lower they will be more likely to buzz when you play hard or with imprecise technique. 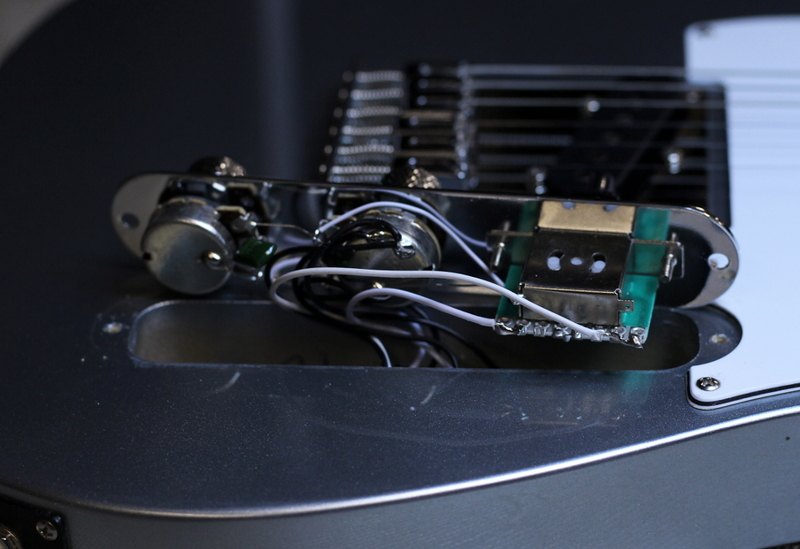 The action on acoustics is lowered by removing the saddle (the white insert in the bridge that the strings break over) and removing material from the under side, and on electrics there is usually a mechanism to allow easier adjustment. Sometimes buzzes and rattles can be caused by issues with the frets themselves: this is definitely something best left to an experienced tech as it’s very easy to make a mistake that takes a lot of work to repair. 2. My guitar seems out of tune with itself! We’ve already taken a look at one of the possible causes: if the nut is too high then you will likely have tuning problem caused by bending the strings slightly when you fret the lower notes. If the problem is with the nut then it’s going to be most noticeable at the first fret and less noticeable with each fret further away from the nut you go. However, most guitars will play fairly well in tune in the open chords but drift out of tune the further you go towards the other end. If this is the case your first thing to check is that the strings are fairly new. If they’re really old, there’s a good chance the problem will be resolved with a change of strings. If the strings are new and the problem persists, the next thing is to check the action (see the post about neck adjustments), as a high action will also cause the guitar to appear sharp in the upper fret positions. On acoustics, unless something is terribly wrong with the way the guitar was built, these two factors are almost certainly the cause. On electrics, the intonation can be adjusted – and if you still have tuning problems then we need to see if your guitar is adjusted correctly. The best way to check is to play a harmonic at the 12th fret (pluck the string with your fretting finger touching the string but not the fret) and then compare it to the same note fretted at the 12th fret. If the guitar is intonated correctly, the two notes will be the same pitch. If the fretted note is sharper or flatter than the harmonic, then the intonation is incorrectly set and will need adjusting. Even if your guitar is set up perfectly it’s unlikely that it will play perfectly in tune on every fret – it’s simply not possible to make a fixed pitch instrument with strings of multiple thickness and materials that is perfectly in pitch. There have been many attempts to improve this – the Buzz Feiton tuning system and the Earvana nut are both modern examples – but the chances are you’ll have to live with a tiny bit of compromise when it comes to being in tune. 3. My guitar won’t stay in tune! Again, this is a common problem that you might encounter with a guitar that needs setting up. Firstly, don’t blame the tuners! Lots of people unnecessarily spend money replacing tuners because their guitars don’t hold their tune Cheap tuners can be a pain when it comes to getting the guitar in tune in the first place but once you’re in tune it’s unusual for a tuner, however cheap, to actually slip. One thing you can check is how your string is attached to the tuner. It doesn’t take many winds around the post to keep things secure, but lots more winds than you need can contribute to tuning problems, particularly if you bend strings a lot or use a vibrato. Aim to have about three turns around the post if you can. Also, make sure your strings go the right way around the posts! The main culprit of tuning problems is the nut. 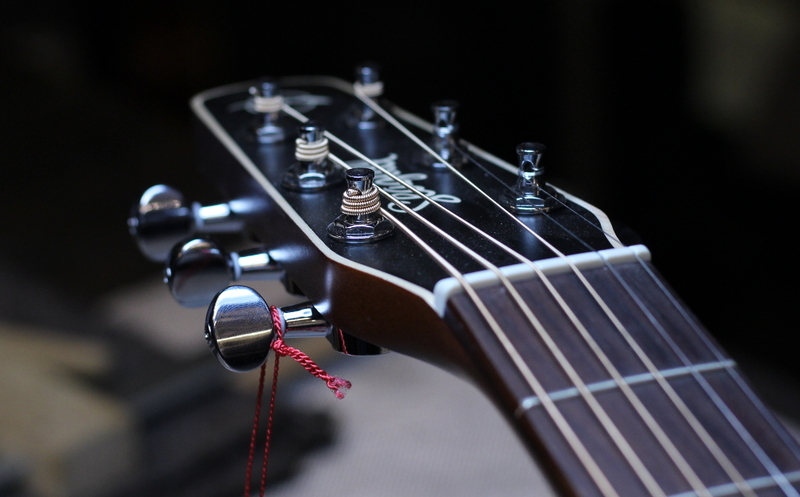 If the slots are too tight, the strings will snag at the nut do when you tune the guitar the change in string tension is uneven between the main length of string and the bit of string between the post and the nut. Over the next few minutes the string balances itself out and is no longer in tune. There are a few DIY fixes for this – lubricants such as nut sauce and pencil graphite can help the string move smoothly through the slot – but the best approach is to have a open out the slot with a file. Overly deep slots can also contribute to tuning problems, as can the slots in the saddles on electrics. Again, if you bend strings as part of your playing technique or use a vibrato, problems caused by the nut and saddle will be much more noticeable. 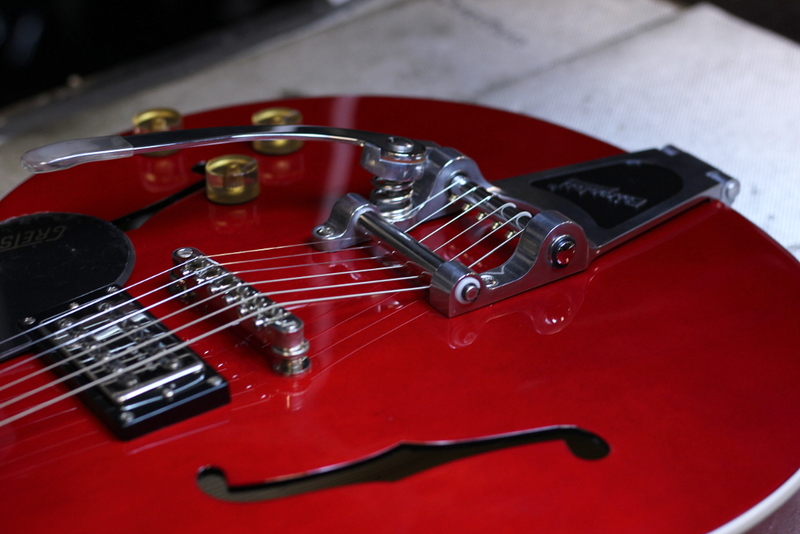 Vibrato systems on electric guitars are often blamed for tuning problems but they’re as likely to highlight problems with other areas such as the nut rather than cause issues themselves – Bigsby vibratos are a good example of a much maligned system where the Bigsby usually highlights elsewhere rather than requiring adjustments to the Bigsby itself. Strat and Floyd Rose style units do require a little set up work to optimise them, both in terms of tuning and how the unit feels in use. If using the vibrato causes the guitar to go out of tune, a set up is definitely a good idea. 4. My electric buzzes or crackles! The electrics in a guitar often need a little tlc every now and then. An electrical buzz that goes away when you touch the strings is a good indicator that your guitar is not properly earthed – an easy fix for someone who knows what they’re doing. Constant electrical hums are common in certain types of guitar and to a certain extent if your Strat or Tele hums in the single pickup positions (you’ll notice it cleans up on combined pickup positions as they are usually wired to be hum cancelling) it’s inherent in the design, but if it bothers you there may be something a tech can do to shield the electronics and reduce the issue. Certain electrical appliances contribute significantly to hum, so if you’re experiencing lots of hum try setting up the amp in another room. Dimmer switches and computer monitors are a common culprit, and noise management might be as simple as sitting in a different chair – you don’t need a tech to fix that one! The pots that control volume and tone on electric guitars can gradually pick up dust that causes crackles when you turn them – that’s a fairly easy fix that would be covered in a set up. You can attend to a crackly pot yourself using contact cleaner from Maplin, although be careful not to get splash back onto your finish as certain finishes aren’t too keen on it! If in doubt let someone else do it. Selector switches occasionally develop crackles of their own as the contacts wear – sometimes this can be fixed but the switches in certain import electrics tend to be fairly cheap components and benefit from an upgrade. Occasionally dry or damaged solder joints can cause problems with electronics. In this case a tech with knowledge of the circuit type used on the guitar is the best way forward. Hopefully that run through should give you a better idea of what’s involved in a set up and a better idea of how to spot when your guitar isn’t performing as well as it could be. If you want to book your guitar in for a set up just pop in to the guitar department with it and we’ll do a check over for you!